I don’t regularly photograph my lunch. I mean, you’ve seen one peanut butter and jelly sandwich, you’ve seen them all. And everyone knows how to make them. No fun. On the other hand, sometimes my lunch is sorta photogenic, like this chicken salad. I was just going to eat it, and then I really looked at it and thought to myself, you know, someone else might want to make this. The light wasn’t great to shoot, but you get the basic idea of what it looks like. I had been thinking about a rotisserie chicken for the last week. Just to have on hand. They’re so easy. But it seemed every market I went in, I was compelled to pick up big containers and bags of greens. At the Korean market I bought a big plastic box of pea shoots and a small one of alfalfa sprouts. Then I went to Ralph’s and a plastic box of baby arugula hopped in my basket along with a big bunch of Italian parsley. A head of lettuce and fresh basil. Zucchini and avocado. I think my body was trying to tell me something. I couldn’t wait, I opened the pea shoots in the car and started stuffing in mouthfuls. Jeez, what was wrong with me. Back in the kitchen, I mixed up the vinaigrette. Then a family member came into the kitchen and asked what I was making and what smelled so freaking good. It’s the vinaigrette, I said and I’m making a salad. Well, since you’re making one, how about doubling everything and making two, he said ingeniously. Ok, ok, beat it, I’ll let you know when it’s ready. 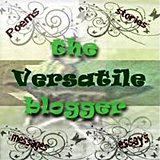 So this is what I came up with. The pea shoots, arugula and parsley were so tasty together, in a way lettuces could never be. And let me tell you, this vinaigrette will knock your socks off. And maybe I’m weird, but I love the salty parmesan mustard umami plus the acid-y lemon juice on the orange slices. So if you’re craving green stuff for lunch, this will probably do it for you. It absolutely did it for me. 1. In a large bowl, toss the pea shoots, arugula and parsley together to distribute evenly. Drizzle about ¼ cup vinaigrette over greens and, using tongs, turn over several times to coat. 2. Place half of greens on each of two dinner plates. 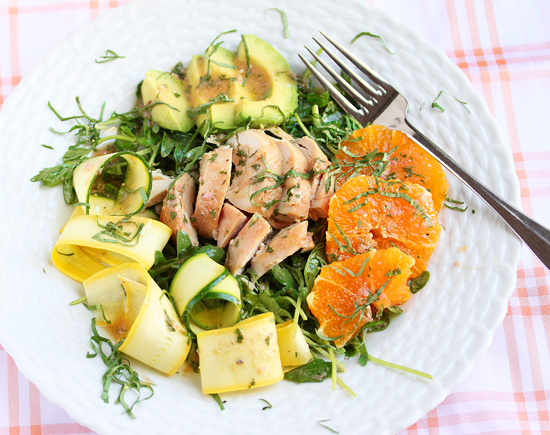 Arrange half of chicken, avocado, zucchini and squash strips, and orange slices on top of greens on each plate. 3. Drizzle several tablespoons vinaigrette over chicken, fruit and veggies. Sprinkle with basil. Eat. 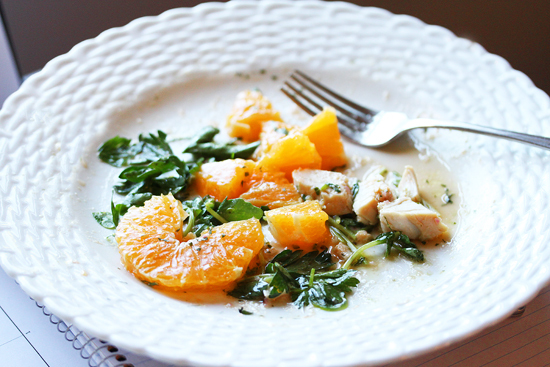 Note: Slice oranges on a paper plate and add juice collected into the vinaigrette. 2. Whisk in the olive oil in a slow steady stream until incorporated. Stir in the Parmigiano. Note: This recipe makes more than needed for this recipe. Store extra in fridge. Use on additional salads or as marinade for chicken and fish. Once a food stylist, always a food stylist! Thanks for taking the time to photograph and share this delicious dish with us, it looks great. That is a foxy lunch! I whipped this dressing up this morning, after seeing your gorgeous photo! This is some seriously good salad dressing! I will be eating this all week, happily.